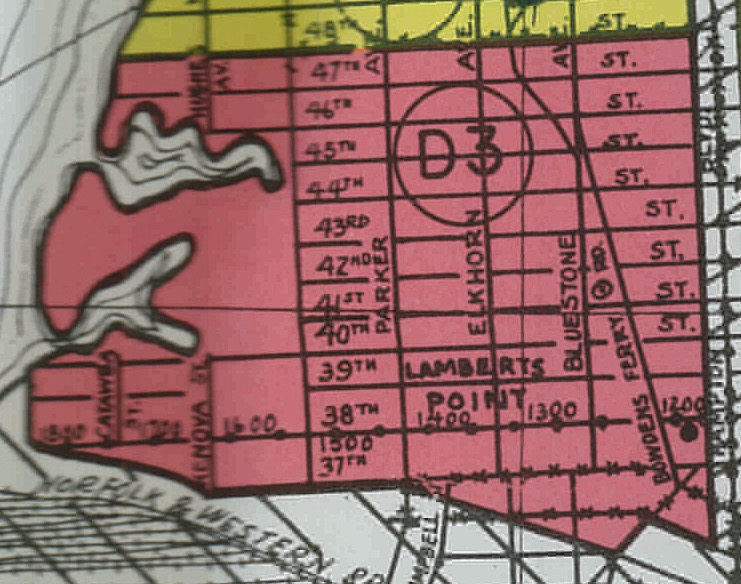 Lambert’s Point is a neighborhood named for the land that juts out into the Elizabeth River. The area, once farmland, was first annexed by the city in 1911. It began as a residential development in the late 1800’s for nearby railway and coal yards. The surrounding area was primarily industrial and commercial area, rated D by HOLC. World War II created a dramatic increase in demand for factory workers and housing, but demand cratered after the war and the neighborhood suffered from lack of investment. The city-wide urban crisis and resulting suburban migration of the 1950’s saw middle class residents leave, but working class residents stayed behind to maintain the neighborhood. In 1930, William & Mary established a satellite campus in the area, which grew into Old Dominion University. ODU is now an institution of 25,000 students and its campus makes up nearly half the neighborhood, occupying land between 43rd and 49th Streets.